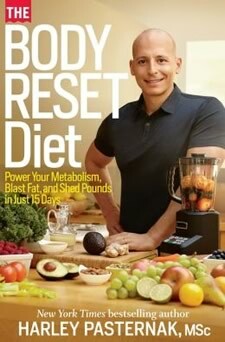 The Body Reset Diet was created by celebrity personal trainer, Harley Pasternak. His list of clients includes many A-list celebrities such as Halle Berry, who he helped prepare for her role in Catwoman. He is also the bestselling author of the book, The 5-Factor Diet. The Body Reset Diet is a weight loss plan he created for real people to produce immediate and dramatic results. It is designed to reboot your system and put you on the right path to achieving the body you want. Moderation isn’t always enough, at least as a first step towards real weight loss. We need to reset the way we think about food. We need to reset our metabolism. We need to reset our bodies. This plan requires you to make some fairly major changes to your diet. However, unlike crash dieting it will not compromise your nutritional intake and it will support your health. His approach also promises to help you avoid the yo-yo effect that commonly occurs when people go on strict diets. The Body Reset Diet was created to give you rapid results in the beginning because this inspires confidence and motivation to stick with the plan. The benefits of this approach have been supported by scientific research suggesting a greater chance of long-term weight loss success. The Body Reset Diet is centered around blending your foods as a healthy solution for rapid weight loss. Pasternak claims that this is the easiest and most effective way to release excess pounds. Consuming smoothies for your meals provides immediate improvements in health and is less drastic – and less expensive – than juice fasting. The smoothies contain all of the nutrients you would normally get from a meal including fiber, healthy fats, protein, vitamins, and minerals. It is just that it is in a drinkable form. The book offers many tasty, yet nutritious smoothie recipes. If you don’t have time to make smoothies – get them from Organifi. The first five days of the program focuses on smoothies that are designed to keep you satisfied and boost your metabolism. 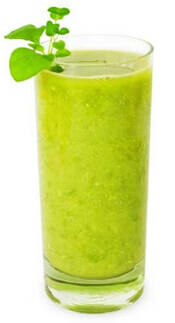 Each day you consume three smoothies – a white smoothie for breakfast, a red one for lunch and a green one for dinner. In addition you will have two crunchy snacks in between. This phase will boost your metabolism, heal your digestion and reset your palate so that you start to crave healthy foods. In the second phase – which also lasts for five days – you begin to reintroduce solid foods. For one meal each day you can choose from healthy options such as soups, salads, sandwiches, stir-fry and sushi. For the last five days of The Body Reset Diet you will replace another smoothie with a solid meal. You will continue to have a smoothie for breakfast but now have more options for lunch and dinner. Berries, pear, grapes, cherries, orange, pineapple, spinach, avocado, fat-free plain Greek yogurt, low-fat ricotta cheese, turkey, chicken, beef, tuna, shrimp, egg whites, almond milk, coconut milk, protein powder, hummus, cannelini beans, air-popped popcorn, watercress, arugula, spinach, red pepper, Swiss chard, sweet potato, low-fat mayo, whole wheat bread, brown rice, soba noodles. Walking and light resistance training is all that is required to achieve a celebrity physique. The Body Reset Diet recommends walking at least 10,000 steps per day. Also included are specific exercises you can do on each phase of the diet. The Body Reset Diet: Power Your Metabolism, Blast Fat, and Shed Pounds in Just 15 Days retails at $25.99. Produces rapid weight loss in the beginning, which enhances motivation to stick with the program. Smoothies are easy to make and don’t require much time for preparation. High protein, high-fiber diet helps to reduce appetite. Some dieters may not feel satisfied with liquid meals. Difficult to eat out and stay on the plan. Initial weight loss may be regained if normal eating is resumed. The Body Reset Diet is a 15-day weight loss plan based on consuming smoothies in place of your regular meals. Most dieters will experience rapid weight loss without feeling too hungry or deprived. However in order to maintain this it will be necessary to continue to make healthy food choices and control portion sizes upon finishing the Body Reset Diet. Get Red and Green smoothies from here. I made a mistake with smoothies I used red s.moothie for dinner instead of lunch is this a problem for all five days. I want to start the reset diet my problem is to find rasberries and blue berries are there no substitutes. you can buy all different types of frozen fruits. I just stocked up on frozen blueberries, raspberries, bananas, cherries, peaches, avocado, and pineapple. most grocery stores will carry all of these frozen fruits.